Your home’s landscaping in Virginia Beach is easily one of the most important aspects of your entire property. Not only is your landscaping one of the first things that your family and guests are going to see every time they pull up to your home, but it also plays a very important factor in the overall value and curb appeal of your home. As such, it is important to make sure that you ensure that anytime you are having any kind of landscaping work done on your home, you ensure that you have the assistance of a team of experienced landscaping professionals on hand to make sure that everything gets done right the first time around. Here at Winesett Nursery & Landscaping, we are the Virginia Beach area’s leading source for high quality landscaping services, so if you have a project in mind that you’ve been putting off for some time now, give our team of professionals a call and let us show you what we can do for you. Here at Winesett Nursery & Landscaping, our team of Virginia Beach landscaping professionals have been helping our customers get the high quality results they need from their landscaping services since 1979, and we have no intention of stopping anytime soon. Over our years of service to the local area, we have garnered a name for ourselves as the premier name when it comes to high quality landscaping services, and that isn’t a reputation that we take lightly. If you have any questions about our full line of high quality landscape design services for Virginia Beach homes and businesses, or if you would like to schedule an appointment for consultation with one of our specialists, give us a call today. Our team of experts are always standing by and would be more than happy to assist you in any way we can. If you are like most homeowners here in the Virginia Beach area, you want to be sure that your home’s landscaping remains a healthy and attractive part of your home’s design, and the best way to do that is to make sure that you have the assistance of a team of landscaping professionals that you can trust to deliver the service you’ll need to keep your home’s landscape looking its best, all through the year. 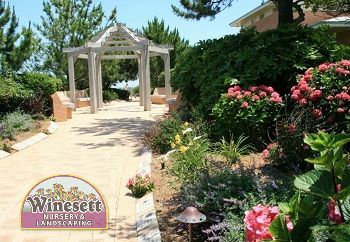 Here at Winesett Nursery & Landscaping, our team of Virginia Beach landscaping professionals will work hard to ensure your landscape gets exactly what it needs to continue looking its best at all times. When you make the decision to call in our team of experts, you can always rest assured that you are getting the assistance of a team that is going to give every job their all, no matter how big or small it might be, and that your property is going to come out looking better than it ever has. If you need landscaping services in Virginia Beach, VA then please call Winesett Nursery and Landscaping at 757-426-7880 or complete our online request form.